Remember way back in the day when your mom told you to wear your gloves or else your hands would be cold? You never did listen, did you? Well now that you are all grown up and enjoy the feel of your fingers, grab a pair of the Alpinestars Polar Gore-Tex Gloves and your polar experience will be enjoyable. Alpinestars is based out of Italy but even they know, not everyone rides just in the Tuscan Summer. That's why they have designed the brand new Alpinestars Polar Gore-Tex Gloves. These bad boys use a Gore-Tex membrane to keep your digits dry but that's not all! They've also teamed up with 3M to provide 100G/sqm of Thinsulate thermal insulation on the backhand. It'll be like your hands are getting a warm hug every time you slip them on. Foam reinforcement on the palm and outer hand provide you with abrasion resistance in the crucial impact zones (Can you say cush?). Also, the patented 3rd and 4th finger bridge keep the pinkie intact and attached to your hand. I don't know about you but I think I'd miss the little guy if he was gone. Closing it off, literally, is a neoprene cuff with Velcro closure for a secure grip. 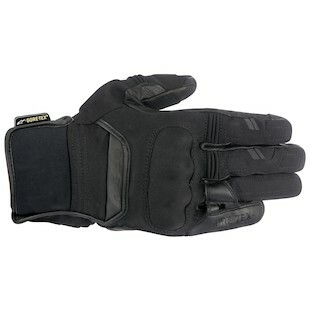 The Alpinestars Polar Gore-Tex Gloves pack a lot of punch at a reasonable price point. They will keep you warm and dry when the weather tries to get the best of you. Lets end on one last feature I forgot to mention. They have a touch screen compatible fingertip on the index finger to use on your touch screen devices. So, give your mother a call! I'm sure she's worried sick about you and the motorcycle she doesn't know about.